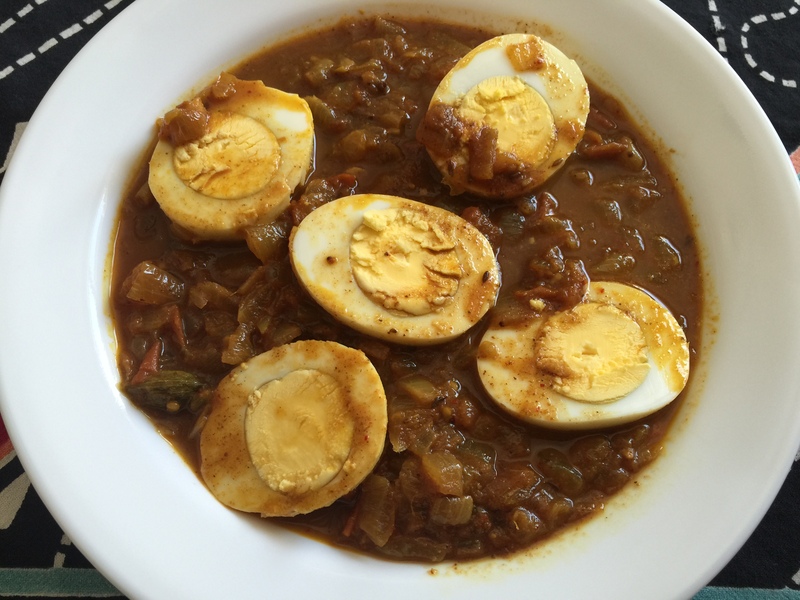 This is a delicious egg curry that I know I’ll be making again and again! Vindaloo has a touch of vinegar which I love. Here is a bit of history about the dish. A lot of times I try and eliminate extra steps, for example, if a spice is added in two different ways skip one way. This time I decided to follow the recipe, layering the flavors. It came out super tasty! Grind together until smooth adding a little water if necessary. Boil the eggs, peel and cut in half lenthwise. Meanwhile heat the olive oil in a saute pan. Add the cumin seeds. Once they start to brown add the cloves, cinnamon, cardamon pod, peppercorns and green chilis, and let them sizzle for a few seconds. Then add the onions and cook down until browned. Add the vindaloo paste and tomatoes and cook down until the tomatoes get mushy. Add water to the consistency you like and the eggs and cook for a few more minutes.